Almost all businesses understand the importance of customer data, but very few are able to harness its power at scale – and maintain consumer trust. The Data Giants who differentiate themselves through their use of customer data build unified marketing and customer experience stacks used throughout the organization. This white paper explains how centralized customer data is essential for personalized customer service, delivering on customer expectations in a hyperconnected world and how having a Customer Data Platform can help you thrive in the digital economy. 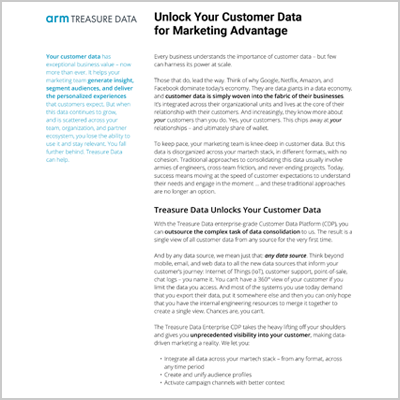 This white paper is sponsored by Arm Treasure Data.